We offer premium range of Grain Dryers. These are acknowledged all over the world for their various features. Our range is used in various sectors. In order to ensure quality, we use qualitative raw material and modern machines and tools. Artificial drying of agricultural products at a qualitative high level in a rational and profitable way. The Cimbria Continuous Flow Grain Dryer program includes three primary models: Single, Twin and Triple-column Dryers, uniform in construction but varying in width. Each model will be variable in size (height) from 14 to 38 sections with intermediate 4-sections-step. This standard line of industrial dryers covers a performance range from 25 to 275 t/h, drying wheat at 100 °C, from 19 % to 15 % moisture content. For all models and sizes there is free choice of 4 potential heating sources, hot air generators fired by oil or gas and heat exchangers for hot water or steam. Furthermore, hot air generators differs as “direct” or “indirect”, including the flue gas into the drying air or not. 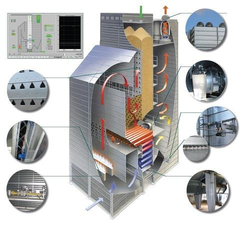 Direct heating is certainly close to 100 % utilization of the energy input often used when drying grain for feedstuff. Indirect heating with oil or gas, when the flue gas is led to a chimney after adding some energy to the drying air, is recommended for all drying purposes regarding human consumption (flour mills), while indirect heating by means of steam or hot water mainly is recommended in plants where steam or hot water already exist for other purposes – like in oil mills or feed mills. The variable size of the cooling zone ensures a final product temperature for safe storage or suitable for the available storage facilities. The Cimbria “Full Dryer Control” includes the electrical motor control centre with PLC process control and safety interlocking, monitored and coordinated by a SCADA system and operated via advanced software data logging PC with LED monitor. Mini flow diagram and windows for each single function provides a user-friendly operating system, simple, reliable and safe. Possible pre-setting of parameters for up to 10 drying recipes for easy sort change. Maximized efficiency regarding energy and power consumption secures low operation costs together with lowest possible environmental impact. Each dryer model is provided with a suitable energy saving system, based on circulation of preheated and relative dry exhaust air from cooling and final drying zones, optimizing the efficiency of all process air. Manufactured from solid materials, chosen to resist more or less abrasive products, a strong support structure and heavy discharge construction ensures a long-lasting lifetime to all Cimbria Dryers. Looking for Grain Dryers ?